Recently I was visiting one of our customers and was asking me about what types of messages he should be sending his agents desktops. What I recommend is five different types of messages: Personal, Threshold, Variance, Voluntary time off and Voluntary over time messages. Each is explained and an example is given below. Personal Messages: These are the non business related messages. Messages such as Happy Anniversary, birthday announcements, congratulations, group announcements, award messages, etc. These messages are not to be taken lightly. One of the issues that many call centers face is poor overall morale. These simple messages can do wonders to improve an agent’s day. It has been shown when the environment in the call center is positive agents perform better and this increases customer retention and helps acquire new business. Threshold Messages: When an agent or team leader has exceeded a statistical level that is important to the overall call center goal. 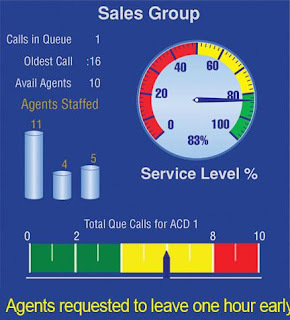 Typically these are KPI values for calls in queue, service level, oldest call waiting, etc. These messages help keep the agent on track to meet daily performance goals. Messages of this type are automatically triggered by the Spectrum software. Variance Messages: These messages are more critical to the agent and call center. Messages of this type are triggered when a performance metrics goals has been missed or exceeded. For example KPI Values for Abandon Rate, Average Speed of Answer, FCR and CSat are all performance metrics and would trigger a variance message to automatically be sent out. Voluntary time off (VTO): Occasionally the WFM software is inaccurate and you have a call center that has many idle agents. When this occurs a message can be sent to agents that have previously agreed to leave early for the day. Tremendous cost savings occur using this automatic message requested those agents who have agreed to leave early when they are idle. Managers are notified by a similar message telling them agents will be leaving early because of the low call volume and high idle time. Messaging in the call center is not just personal messages directed at specific agents. Messaging can also be used to change behavior (Threshold and Variance Messages) and to cut costs and increase revenue (VTO and VOT messages). Contact Spectrum to learn how desktop solutions can help improve your call center’s performance.